My latest guided journal, Body Wisdom Journal, helps busy ambitious women - the leaders and educators of the world - to take a moment to slow down and connect with themselves. This is the fastest, easiest, and healthiest way to lose weight and align your health goals with your day to day life. The journaling takes just 5-10 minutes per day, and you can get started with the free audio book, the best way to get started despite your busy lifestyle! Sign up below to access the Body Wisdom Audio Program. This is my gift to you! This includes all the introductory chapters to the Body Wisdom Program, a perfect compliment for ambitious leaders who want to fit the journal in their busy schedule. This audio can also be used on its own, and includes 7 days of prompts to cultivate your own Body Wisdom. The best part? It's a quick listen at just about 30 minutes long! Purchase the journal by clicking this link, which will take you to Amazon where you can purchase the kindle version and use your own notebook, or buy the beautiful paperback and receive free Prime shipping. Alegra Loewenstein is a best-selling author, speaker and coach with a background in biology and creative writing. Guiding us back to enjoying and actually living life in the midst of our hectic full schedules is part of her passion. She creates journals that inspire busy, ambitious leaders to slow down, tune in to their holistic whole body, connect to their desires, and cultivate their intuition. Her latest, Body Wisdom Journal, is out on June 12th! Alegra's first guided journal, Emotional Eating Detox, was a two time #1 bestseller on Amazon, and she is excited to bring more health and happiness to the world with her next guided journal: Body Wisdom Journal! Already a #1 seller as a new release! Want to start meditating but feel like it's too hard, you don't have the time, or just think it's boring? 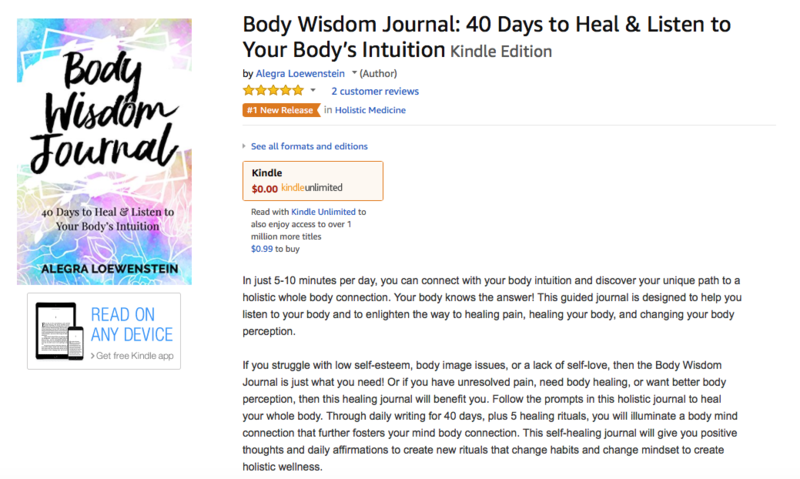 You are in luck, Alegra Loewenstein's Body Wisdom Journal brings the benefits of a mindfulness practice in just 5-10 minutes per day of guided journaling! You can even get started with the free audio book!